From an Idea to a Ferrari-A Comic Extravaganza!-Part Four! Alright, the running joke since I first listed my short story "Where I can't Follow" has been that I was planning to buy a Ferrari with my first monthly royalty check. I say joke because I never expected to sell nearly enough copies to put one of Enzo's finest in my driveway in the first month. Hell, at .99 a copy, I didn't expect that to EVER happen. I knew full well that I would be purchasing a toy Ferrari, but as I received enough from my sales to buy two I made the deal with my son Skyler that we would EACH get new Ferrari's. I had let him know how the book was doing, so he knew not to expect much, but when I let him know what I had planned, he instantly found the humor in it. Hey, he is my mini me, after all. On our way back from Wal-Mart, he said something that got me thinking. "It's too bad we couldn't make these real." And while "real" magic isn't something I believe would be able to serve our purposes, a little creative magic just might. It would be a fun little project between father and son as well. 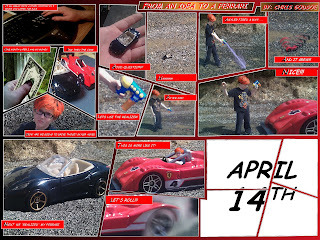 So between rounds of Call of Duty and Halo, we set about taking pictures that I would later turn into a Comic, chronicling our attempt to turn 1/64th scale Hot Wheels (c) Ferrari's into something we could get into trouble with. 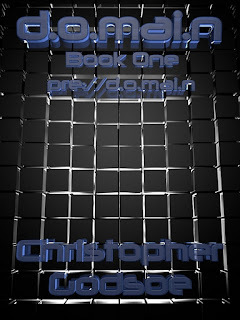 As I am trying to encourage return visits to this blog, and as I simply ran out of time tonight, I will be releasing a section of the story per day until it concludes on April 14th. So, without further ado I present the first chapter of a comic titled, "From an Idea to a Ferrari". I hope that as it unfolds it will bring a smile to a few faces, as it has certainly brought a smile to mine. EDIT! It is barely the 11th, but the second panel is up! ALMOST COMPLETE! Panel FOUR of Five!